Added on 31 July 2014 . By Kiran Khattra. 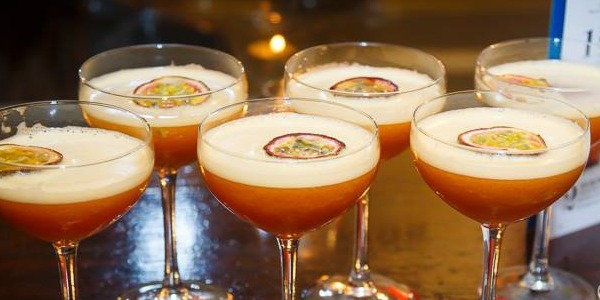 Located in the heart of Theatreland and smack bang in the middle of West End nightlife, Be At One Soho is the perfect cocktail venue to start any night out. With the sun making a rare appearance and the evening buzz spreading through London, it only seemed fit to take a gander to Be At One. Proudly perched on the top of Great Windmill Street, we could see the bright blue venue from a far. A large circular bar occupies the room as its centerpiece, against a backdrop of bold and colourful bottles. With dim lighting, cosy booths, dark wooden furnishings and large windows letting in natural light, the cocktail bar gives off a cool and calm vibe, making it approachable for anyone to grab a cheeky one. 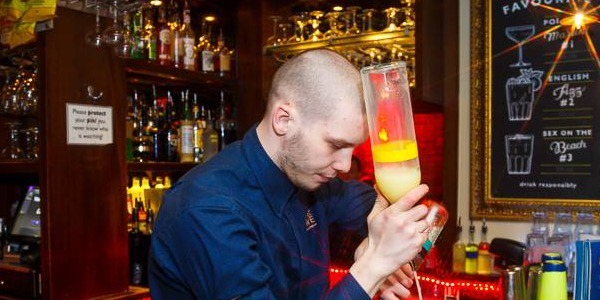 Intensively trained, you won't be able to find any faults with your cocktails. “Thursday is the new Friday” is definitely the motto here! With Happy Hour in full swing the place was over-spilling with City workers and theatregoers. The lively bar staff are guaranteed to get you in the mood for a bit of fun and laughs as they whip up your chosen concoction without a care in the world. With a mix of 80's and 90's music playing throughout the evening, you find it almost impossible not to sing along. As Happy Hour ended, the place did empty out slightly, but not enough for Be At One Soho to lose its buzzing charm. Be At One Soho never fails to deliver a lively atmosphere and buzzing crowd. After traipsing through Leicester Square and towards Soho, we were a little parched to say the least. With menus scattered throughout the bar it was time to tingle our taste buds and get our hands on something delicious. I first opted for the Blueberry Muffin (my new favourite cocktail), which was perfectly sweet. I was keen to test out the well-trained mixologist and his skills, so I ordered several drinks from different sections of the menu to see how well each one was devised, and d’ya know what? All were made as effortlessly and flawlessly as one another. Four drinks later, I decided to end on a dessert-type-note and have the Irish Disco Biscuit – for those who love Baileys and Oreo cookies, it is THE perfect combo! A cocktail to cater for everyone's palate, you're well and truly spoilt for choice. In an ideal location and boasting a brilliant Happy Hour, you really can’t go wrong with Be At One Soho – and that’s not the cocktails talking. 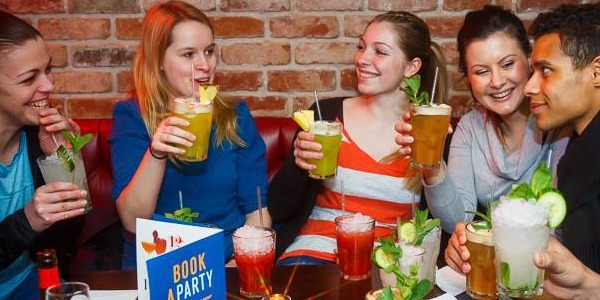 With cheeky bar staff that can make a mean Margarita, it’s a great place for after work bevvies and to start your night out in the West End.